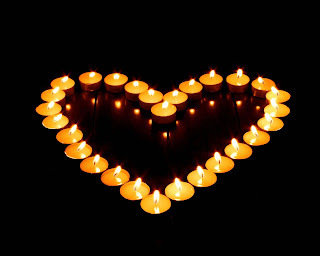 what a lovely tribute, the candles glowing in the shape of a heart. it says so much about donna - the amazing and brilliant light she was to so many, and a heart filled with such big love for marvin, for life. thank you for capturing all of that about her...it's so true, sometimes there just are no words. Thank you for this, Shelli. I'm sure going to miss Donna. this is not a nag for a post! just checking in, letting you know i am thinking of you, and that i continue to send my most powerful vibes to you for comfort and healing.